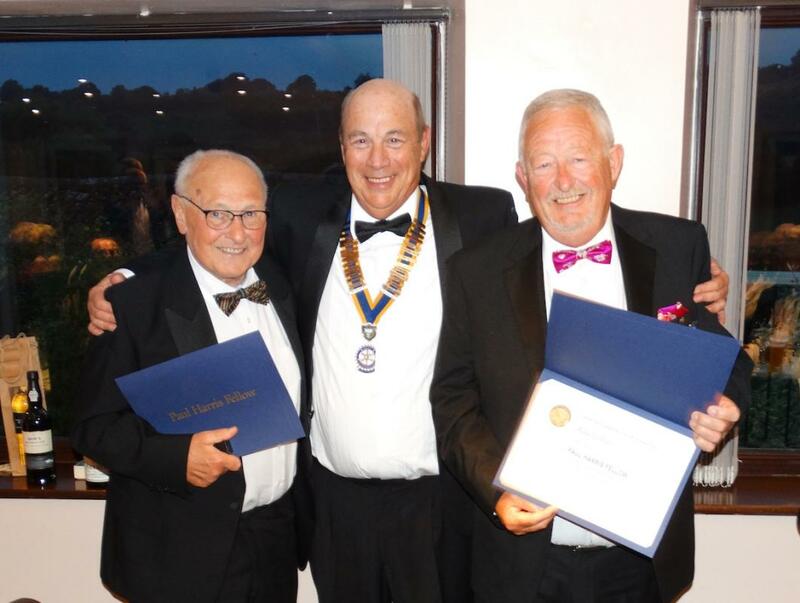 ‘On behalf of the club I have the pleasure to present the Paul Harris Award to two long serving, loyal, hard-working, inspirational Rotarians: Ray Lithgo and Barry Gillett. Whenever there is ‘something to be done’, you can always rely on these two gentlemen to be the first to put their hands up and get stuck in. Year after year they have both managed and helped with the Club’s activities. Both have had more than their fair share of health problems for several years, but they have not allowed that to diminish their contribution and participation in all the club activities and events. They have approached Rotary life with enthusiasm and more than a dash of Cockney wit. bs to donate towards this charity. Over the last 10 years he has been a key part of the team that has raised over 1.5 million pounds. He has always been a keen supporter of our social events and has run the bar on many occasions. Barry’s energy and enthusiasm are irrepressible, and he loves nothing more than organizing the sporting side of our activities. For example, for many years he has organized the local primary school football competition for both boys and girls as well as being a long term serving governor of Pensford Primary School. Indeed, I think I am right in saying he has even led a team of Rotarians to paint and repair parts of the school. Barry’s interest in volunteering to coach sports started before he became a Rotarian – he played and coached at Hillhead in Glasgow where the local press referred to him as ‘Stuffy’ because you knew were going to get stuffed when he tackled you. His love for rugby continued with Manchester University where he coached their team for 4 years. He was also a demon water polo player and volunteer swimming coach.